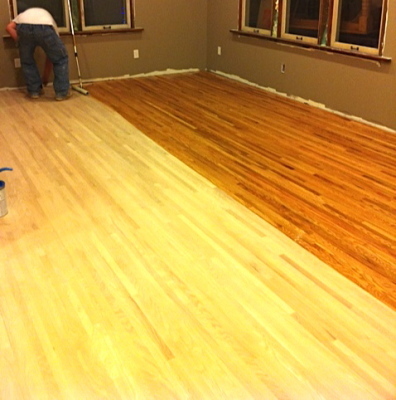 G&S Hardwood Flooring uses only the highest quality equipment to maintain a dust free environment while sanding. All of our equipment is attached to a high suction portable vacuum that keeps the room and house virtually dust free. We use the highest quality water based floor finishes in a variety of sheens. All of our sheens have excellent luster and durability with a very low VOC that benefit the floor owner, the installer and the environment. G&S uses many different types of stains as well as different methods of staining to bring out the best color or shade to meet your desire. Natural wood color, ebony, as well as pickling white or gray, our many years of experience will help bring out the best in your floor! Call us today for a free in-home estimate!! !